In 1869, Henry Varnum Poor published an investor’s guide to the American railroad industry. As it approaches its 160th year, New York City‘s S&P Global, the company that bearing his name, is an elite firm that organizes an index fund for the stock market and provides important financial information to businesses around the world. S&P Global is one of the largest financial analytics firms in the world, which means that many MBAs who aspire to roles as quants should read on. For those familiar with the Wall Street Journal, S&P Global’s massive international presence in the financial market is hard to miss. MBAs who want to pursue international opportunities or return to their home countries can find many opportunities with S&P Global, operating 65 offices spread across six continents. 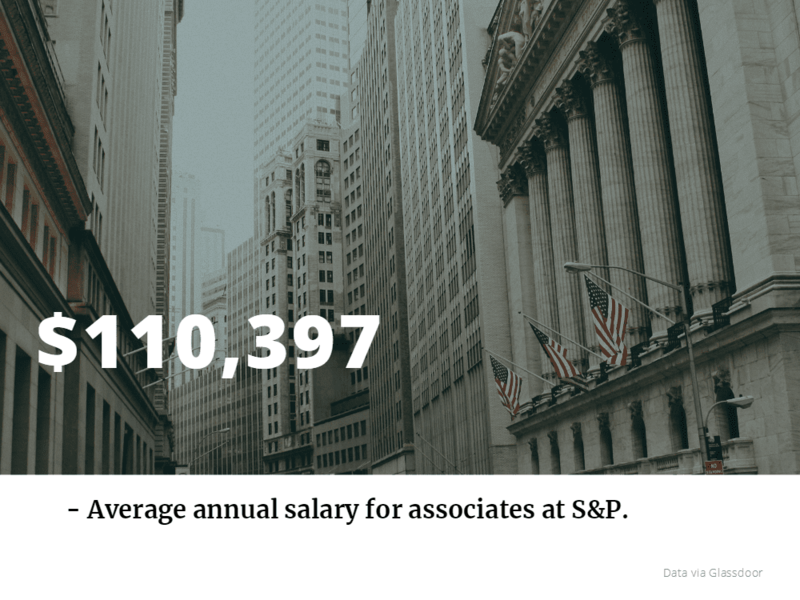 Given the prominent position in finance, S&P Global offers extremely competitive wages to its employees. According to Glassdoor, MBAs who begin their careers at S&P Global as associates can earn an average of $110,397, with an additional $15,000 in cash bonuses. S&P Global and S&P Global Market Intelligence both emphasize strong work-life balance and benefits. In addition to comprehensive health, vision, dental, and retirement benefits, S&P provides employees with support for child and elder care, adoption assistance, and a maternity management program for new mothers. S&P also offers employees a $5,000 refund for continuing education courses. Another major benefit that employees extol is the high quality of their colleagues, who are described as extremely smart and open to collaboration. Some also mention how S&P Global is a fantastic place to learn about the business and get a foothold in the field. It is critical that all prospective employees to understand what these values mean to them and how they can be applied to their work at S&P Global. The application process is rather straightforward. For example, prospects for the associate position are first screened through a 30-minute phone interview. If the phone interview is passed, candidates are called in for a series of interviews and a two-hour in-house rating assessment, which requires that the candidate writes a one-page recommendation based on information provided to them by the firm. As noted above, throughout this process, the firm attempts to assess the candidate’s fit within the S&P Global culture. S&P also looks to ensure that candidates have the technical skills necessary to thrive in the job if hired. The best candidates will have made contact with current employees to review what systems are being used at S&P Global, particularly in their desired area of employment, and will know how their experience and mentality fits with the firm’s values and principles. Sales Associate – Investment Banking/Private Equity – New York City, U.S. Product Manager – Digital Storefront – New York City, NY or Charlottesville, VA or Centennial, CO, U.S.
An MBA degree is not a requirement for the position. Rather, in line with the experience many MBAs have already earned by the time they earn a degree, the Product Manager should have at least three years of business analysis or project management experience, and four to six years of business experience in general. Marketing Manager – New York City, U.S.
Business grads with at least five years of related experience may be very interested in the company’s Marketing Manager role in New York. They’re looking for candidates that can craft a compelling marketing narrative, working alongside the sales, research, and product teams, helping to build the brand.